Winter is a great time to review yield results, fertilizer rates and potential fertilizer shortcomings evident over the growing season. Winter provides an opportunity to look at soil test results from the fall (and even sample fields that weren’t done sooner – albeit with specialized equipment for frozen soil) and make plans to pre-buy and maybe even take delivery of fertilizer – if the farm is set up for that. But winter is not the time to apply fertilizer. If logistics make it difficult to apply all nutrients around seeding time, the next best option is fall banding. 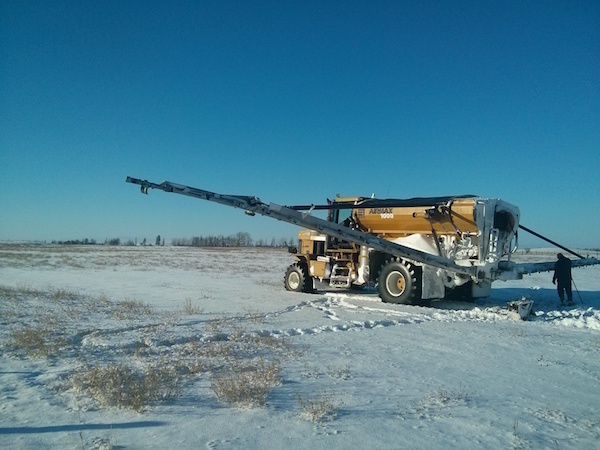 Floating fertilizer over the snow is rarely a positive practice and the risk to farm accounts (from lost fertilizer investment) and the farm environment are just too great. Manitoba restrictions: Provincial legislation prohibits the application of nitrogen and phosphorus between and including November 10 and April 10. 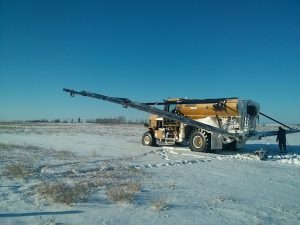 As the Manitoba government reports: “The winter spreading restrictions are in place as the application of nutrients onto frozen or snow-covered soils results in an increased risk of nutrient runoff. Nutrient runoff to waterways contributes directly to algal blooms in Lake Winnipeg and elsewhere.” Read more. Sulphur: Elemental sulphur could, in theory, be applied in the winter without as much risk to waterways. Ammonium sulphate, however, does contain nitrogen, which is a risk. Applying on top of snow is not the best agronomic practice, even if soil under the snow is not frozen.